Early Settlers Cemetery ~ Herr Heinrich Moser Sr.
Today I added a headstone photograph to the page of Early Settlers Cemetery ~ Herr Heinrich Moser Sr., Moser River, Halifax County, NS. 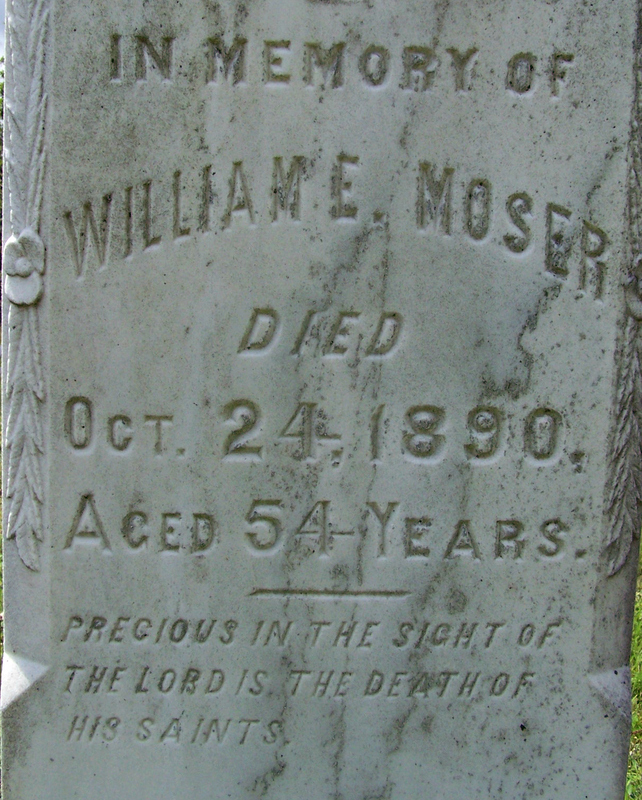 According to William Edward Moser’s headstone, he was born c1836. I found the marriage record for him and Catherine Moser. They were married on February 5, 1877 at Moser River. William was 40 at the time, which would place his birth year as c1837. He was born at Moser River, the son of Ann and George Moser. He worked as a farmer. Catherine was 24 years old at the time of marriage. She was born in c1853 at Moser River, the daughter of Mary Ann and Archibald Moser. Found in the 1881 Census at Necum Teuch, William (age 44) and Catherine (30) were living with their children Eliza Ann (age 9), Esintha (age 5), George William (age 3) and Sarah Matilda (age 2), as well as Catherine’s widow mother Ann Moser (age 70). Samuel Moser (age 46) also lived in the household. This could have been either Catherine’s or George’s brother. 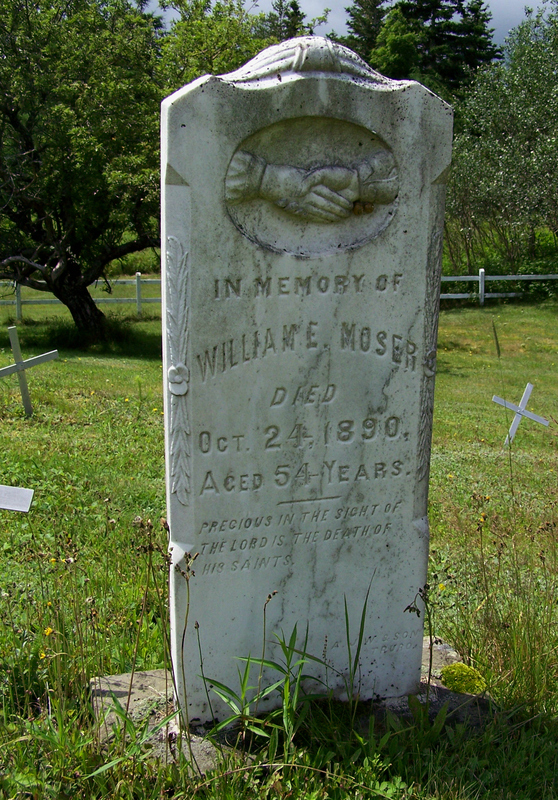 After William’s death, Catherine married Andrew Moser on June 14, 1897 at Salmon River, Halifax County, NS. Catherine was 48 at the time (c1849). This time, she listed Harrigan Cove, Halifax County, as her birth place. Andrew was 58 years old, a widower and a carpenter. he was born (c1839) at Moser River, the son of Maria and George Moser. Atkins, Rosa Bell: Born January 12, 1891 at Harrigan Cove, Halifax County, NS, the daughter of Margaret Ann Turner and William S. Atkins, and the step-child of Bessie.